A fascinating space opera debut novel, Arkady Martine’s A Memory Called Empireis an interstellar mystery adventure. Building a world large enough to be the host for a space opera universe, a world full of multiple interplanetary systems, an empire, several religions, a couple of sorts of aliens, and a few radically different cultural choices – and then conveying that enormity, that lushness and detail, to the reader in a way that neither bores nor confuses them – well, that was the hardest part of doing revisions on A Memory Called Empire. But, when I finally came up with a way to do it, it also ended up being my favorite bit of the finished book. Here’s the amusing and/or horrifying secret about my writing process that I genuinely didn’t know about until I wrote a novel: I underwrite by about 30%. The book my agent and I sold to Devi Pillai at Tor was maybe 95,000 words long, if you squinted and gave it the benefit of the doubt. My edit letter – the first one – consisted of around five bullet points and the instruction go write the other 40k of the book, Arkady. This was both exactly the edit letter I needed, and utterly terrifying. 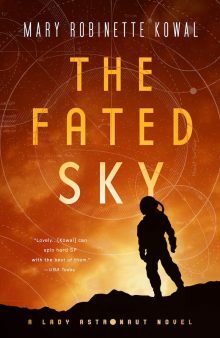 Because, well – how do you put in all the worldbuilding and richness and complexity of a giant space opera universe, while still keeping the pacing and tension of your political thriller spy novel? What I came up with, eventually, was epigrams. Chapter epigrams, which were quotes from in-universe texts I’d created for just this purpose. A customs form, a tourist guide, a pilot’s manual, portions of contradictory histories written about the same event from different cultures’ points of view, a transcript of a news program, a propaganda poster (and what it was defaced with), a request for supply requisition, a bunch of different poems, an instruction sheet on how to apply for a particular job training scheme, a flyer for an intramural handball game … anything and everything, the ephemera of a real world that produces real texts. And half of the texts were from Teixcalaan – my space empire – and half of them were from Lsel Station, my protagonist’s home, which is in constant danger of being absorbed into said space empire. I’m pretty sure I stole this trick from Dune. Thanks, Princess Irulan. 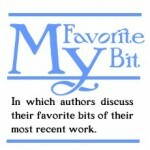 You fixed my worldbuilding, and made my editor like me. But my favorite bit – my favorite set of epigrams to write – was the set which ended up being a pair of contrasting scripts. The Teixcalaanli one is basically a shooting script for a soap opera; the Lsel one is a script for a graphic novel. I loved these specifically because popular culture tells you so much about what a society values, and I got to write some really popular popular-culture bits … and because it was an opportunity to briefly write in formats I don’t usually write in. Here they – they open Chapter 14, which is a chapter about loyalty and making dangerous choices, like whether you’re going to risk back-alley neurosurgery. 29. EXT. DAY: same as before only POV of NINETY ALLOY. Pull back past NINETY ALLOY’s shoulder to watch as they FALL TO THEIR KNEES beside THIRTEEN QUARTZ — who OPENS THEIR EYES and SMILES FAINTLY. You came back for me. I always…knew you would. Even now. Of course I came back. I need you. Where else am I going to find a second-in-command who can win half a war on their own before breakfast? (sobers) And I need you. You’ve always been my luck. Stand down, now. I’ve got you. We’re going home. Panel Three: long shot of Captain Cameron on the bridge of his shuttle. All eyes are on him; the rest of the crew look terrified, eager, impatient. Cameron’s consulting his imago, so have the colorist emphasize the white glow around his hands and his head. He is looking at the enemy ship, floating in black space, super ominous and spiky – the ship’s the focus of the panel. CAMERON: I learned to talk to Ebrekti, back when I was Chadra Mav. This isn’t even going to be hard. … there’s also a small easter egg in the latter one of these, which is one of my favorite tiny things I put in just for me: Captain Cameron, the hero of the Lsel Station graphic novel series The Perilous Frontier!, shares a name with CJ Cherryh’s protagonist of the Foreigner series, Bren Cameron, for extremely deliberate reasons. Those reasons being that a lot of A Memory Called Empire is a love-letter to Foreigner and that whole universe, anyway. So getting to put in a tiny tribute was definitely one of the reasons this epigram-set is one of my favorite bits. Arkady Martine is a speculative fiction writer and, as Dr. AnnaLinden Weller, a historian of the Byzantine Empire and a city planner. Under both names she writes about border politics, rhetoric, propaganda, and the edges of the world. Arkady grew up in New York City and, after some time in Turkey, Canada, and Sweden, lives in Baltimore with her wife, the author Vivian Shaw. 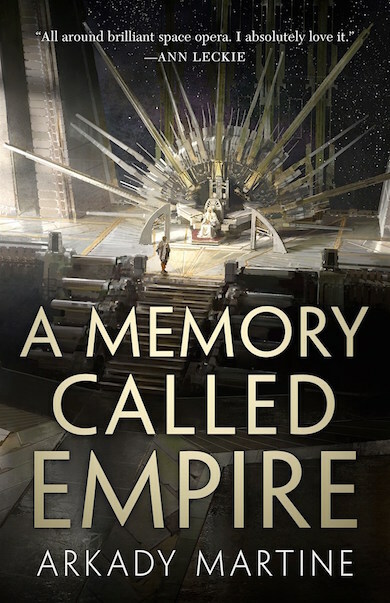 Her debut novel, A Memory Called Empire, comes out in March 2019 from Tor Books, and is available here. Find Arkady online at arkadymartine.net or on Twitter as @ArkadyMartine. Heh, I was thinking this reminded me of Dune (hardly the only book to do it, though), and then you made that reference. 🙂 I like epigrams-for-worldbuilding a lot and I’m looking forward to A MEMORY CALLED EMPIRE!